The Organisme de défense et de gestion (ODG) of Pommard in Burgundy (the association of wine growers) wants the premier crus Rugiens and Epenots recognized as grand crus. The ODG will file a request with the INAO (Institut National des Appellations d’Origine), the French institute that regulates appellations of origin. The Burgundy classification of 1936 recognized only premier cru vineyards in Pommard. But according to the association of winegrowers of Pommard both Rugiens (13 hectares) and Epenots (27 hectares) satisfy the requirements to be recognized as grand cru. Jules Lavalle, the author of the first, 19th-century Burgundy classification system, considered these two vineyards as of the highest quality. Rugiens and Epenots are today the most expensive Pommard’s, both in terms of land prices and wine prices. Wines from Epenots and Rugiens are usually forty to fifty percent more expensive than wines from nearby vineyards. There is still debate about the quality differences between the higher and lower parts of both vineyards, for example between Rugiens Haut and Rugiens Bas or Grands- and Petits-Epenots, with the famous Clos des Epeneaux lying in between. Pommard has 320 hectares of vineyards, including 27 premier crus. The request to the INAO will be presented in early 2012. It may take four to five years before a decision is made. 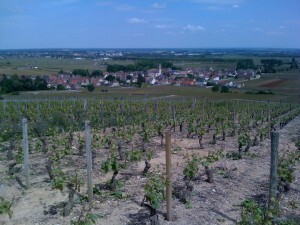 About fifty growers in Pommard have lots in Rugiens or Epenots. Burgundy currently has a total of 33 grand crus. That may eventually rise to 36, because that other famous Burgundy village with only premier crus, Nuits-Saint-Georges, has also applied to recognize its best vineyard, Les Saint Georges (7.5 hectares), as a grand cru.